In living out our values and achieving high-performance operations, we are dedicated to promote and protect the health, safety and well-being of our workforce and the environment. These commitments are documented in our health, safety, environmental and security policies; implemented and tracked, evaluated and updated through our management systems. Our commitment to health, safety, environment and security is also evident in our quality standard ISO 9001:2015, 14001:2015 and 18001:2007 certifications. Ras Al Khaimah is committed to pursuing an environment free of incidents and injuries. This requires the strive and development of the highest level of safety and performance. When such a culture is present people do not live and work safely out of motivation to be in compliance with standards. People choose the safe path because of the deep internal cultural value and their commitment to be safe. This behavior is constantly reinforced with proactive programs, communication and awards. 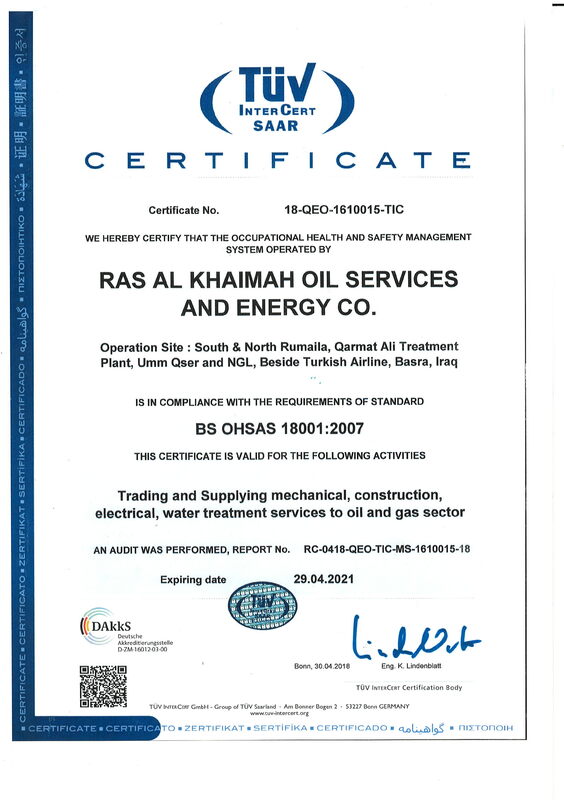 Responsibility for HSE performance starts with Ras Al Khaimah CEO and follows with every successive level. 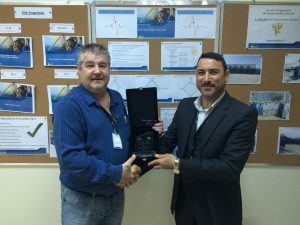 Ras Al Khaimah strives for an incident-free environment with a constant focus on proactive measures and to show the highest level of support for safety excellence. Providing safe working conditions and maintaining continuity of employment is of continual concern. In this regard, it is important that adequate policies and procedures are developed and adhered to in order to ensure safe, efficient operating conditions, thereby safeguarding employees and facilities. The Company will not knowingly permit unsafe conditions; nor will it permit employees to indulge in unsafe acts. Violations of Company rules and regulations will result in a disciplinary action. The Company believes that the safety of employees and physical property can best be ensured by a meaningful program. 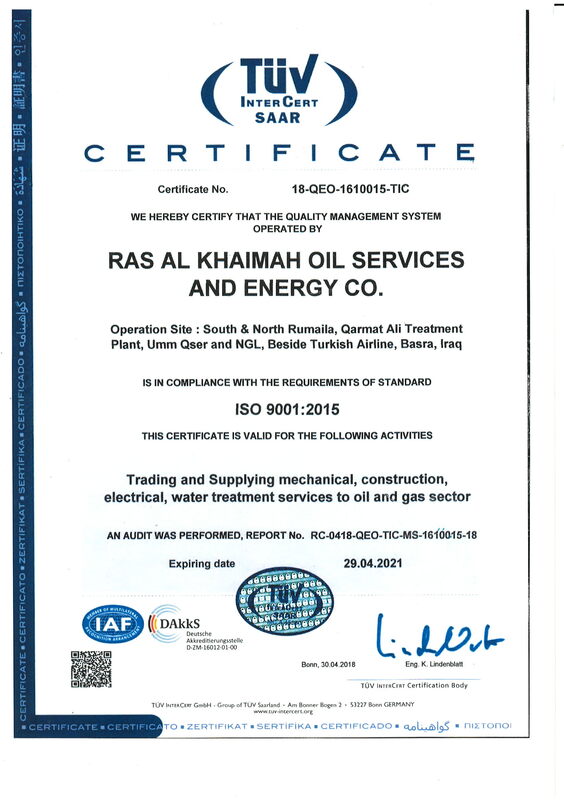 Ras Al Khaimah will prepare and maintain a Project Risk/Opportunity Register. We perform risk assessments and strategy workshops for the elimination or mitigation of all risks related to the WORKS in accordance with the requirements of our “HSE Management policy”. We cooperate with our clients to conduct Construction HAZID workshops covering, as a minimum, survey, installation, construction and related activities. These workshops may be attended by Ras Al Khaimah Key PERSONNEL, other CONTRACTORS, and COMPANY MEMBERS. 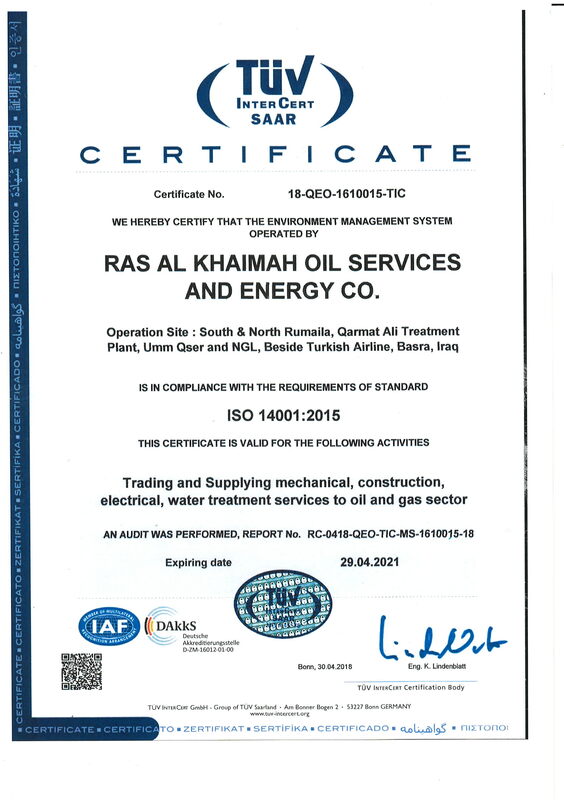 Ras Al Khaimah will demonstrate adherence to the HAZID process and close out any and all issues to the satisfaction of the client prior to commencing each part of the WORK. Since the employee on the job is constantly more aware of unsafe conditions than anyone else, employees are encouraged to make recommendations and suggestions, and to report unsafe conditions to their immediate supervisor so that they can be corrected. Supervisors are generally responsible for the working conditions within their department and the plant. A supervisor should remain alert to dangerous and unsafe conditions at all times so that he/she may recommend corrective action, discipline employees who habitually create or indulge in unsafe practices, assess new or changed situations for inherent dangers, and follow up on employee suggestions for corrective action to ensure that unsafe conditions are not instituted or permit to exist. Company operates in accordance with OSHA guidelines and as such encourages the employee’s involvement in company-wide safety committee meetings to be held quarterly. The committee will specify procedures and actions to be taken in the event of fires, security and other emergencies. Decisions and recommendations will be communicated via the departmental team meetings. All employees are required to report any occupational illness or injuries to your supervisor immediately; no matter how minor, and complete an occupational illness or injury form. When we say SAEFTY FIRST in our project we are also saying ENVIRONMENT is PRIME. We have strict precautions to avoid any pollution to the environment and have emergency plans if anything should happen. Ras Al Khaimah personnel are trained on ways to fight pollution and learned the higher attention of our ethics towards the environment. Ras Al Khaimah also has a suitable scale of equipment to fight the pollution wherever it happened in our scope of work and if that scale is not enough we have the communication with the persons and entities that are able to step in and control pollution immediately. Each project’s structure is ensuring the persons in charge of pollution fighting and pollution literature are the safety manager and his followers in the project organization chart.